Are human misery, poverty and despair a result of personal inadequacy or social injustice? Therefore is the solution to these problems psychotherapy or political action? 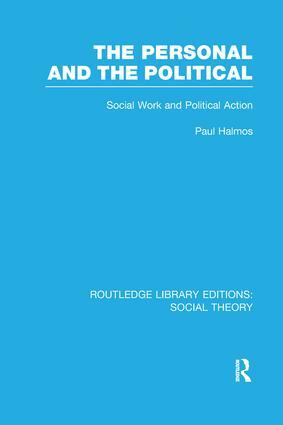 In one of the most important books on social work for a decade, Paul Halmos tries to resolve a dilemma which many social workers experience acutely – the conflict between a desire to help those in need and a fear that, by doing so, they merely support a political system which should, itself, be changed. Such a dilemma was highlighted during the sixties when 'casework' and personal counselling became discredited by the 'rediscovery' of widespread poverty and inequality in western society. To many the only solution seemed to be urgent and radical political action. For Professor Halmos the realities are more complex – an exclusive preoccupation with either personal or political solutions is unlikely to prove fruitful – what is needed is a dual sensitivity and balance. Yet for the author it is the political solution which carries within it the greater risk and he warns of the dangers inherent in the total politicization of social concerns. He argues that social action can become political action and ultimately political control.